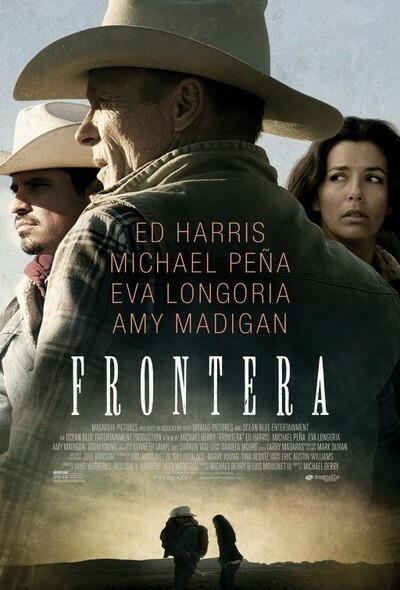 “Frontera” is a well-cast, well-made, well-acted drama that you will probably forget about soon after you’ve seen it. That’s not to say that director Michael Berry does anything wrong with his feature debut. He and co-writer Luis Moulinet certainly deserve credit for approaching the relevant and polarizing topic of illegal immigration from a humanistic perspective rather than a political one. They clearly have the best of intentions to enlighten, not provoke. But in admirably trying to see all sides and depict dramatic situations in a way that’s totally lacking in melodrama, Berry also has made a film that feels a bit too detached and a bit too tidy at the end. This is essentially a Western version of “Crash”: It’s fine when it might have been powerful and even great. He’s certainly assembled some strong actors in telling the story of intertwined lives along the Arizona-Mexico border, including Ed Harris, Eva Longoria and Michael Pena (whose presence inevitably invites “Crash” comparisons). But for the most part, they’re trapped in one-dimensional roles: the stoic lawman, the loyal wife, the proud immigrant. One of them, Pena’s decent-hearted and hardworking Miguel, is wrongly accused of murder. He’d come to the United States in hopes of making a better life for his family, as so many people do daily, but he happened to be nearby when the deadly incident occurred. “Frontera” isn’t so much a whodunit, because we know who’s responsible from the beginning. It’s more of an exploration of what will happen to this innocent man, and whether all the figures involved can get past their inherent racism in order to reach the truth – and, ultimately, some forgiveness. Meanwhile, Miguel’s pregnant wife, Paulina (Longoria), decides to make the arduous trek into the United States herself to track down her husband when it becomes clear that he’s in trouble. What she endures once she leaves her little girl and her parents and entrusts her fate with a group of predatory coyotes is harrowing. The thoroughly de-glammed “Desperate Housewives” star is convincing as she dares to delve into more substantially dramatic territory – so much so that you wish there were more to her character. “Frontera” also views this situation from the perspective of several Americans, including cruel and clueless people who seek to stop illegal immigration in their own way for sheer sport. There’s also the stray Border Patrol agent here and there who’s happy to look the other way for a little cash. The film presents the machinery of immigrant smuggling in detailed ways, from the discarded clothes and empty water bottles that are strewn eerily along quiet, dusty roads to the cramped and dirty quarters these people often must share once they arrive in the United States. At the same time, Berry’s film offers some beautiful and traditional Western imagery, full of warm sunsets and rustic vistas and horseback rides to the accompaniment of a sweeping score. And after making some surprising choices and delivering difficult scenarios in a matter-of-fact way, he ties everything up with a highly metaphorical conclusion that’s more than a little hokey. Maybe he’s a romantic – or at least an optimist – at heart after all.